When is it Expected and How Much? Tipping in London and the rest of the UK, like tipping in most other places, can be awkward and embarrassing if you get it wrong. And, in the UK, tipping when you don't have to can add unnecessary costs to your travel spending. 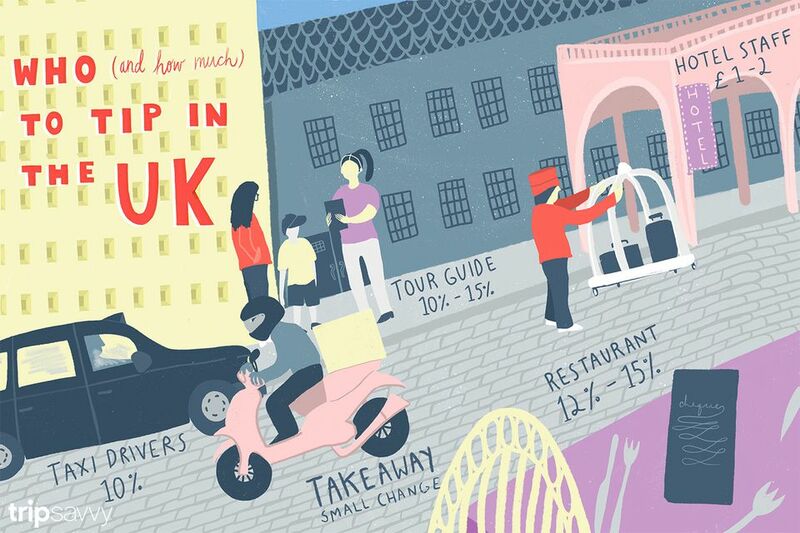 In the interests of saving you money (especially if you are a US traveler and used to 20% tips) and making sure everyone gets treated fairly, here are some quick pointers about tipping in the UK. A service charge (tip) of 12.5% to 15% may be added to your bill but the practice is not universal in UK restaurants. And it may not always be easy to discover whether it is either. Some restaurants print their service charge policy on their menus (long gone by the time you pay your bill), while others make the service charge very clear on the bill. Don't be embarrassed to ask. And don't be too flustered to read your bill. It is not uncommon for waiters to leave the "total" line blank on credit card devices, tacitly inviting you to add a tip when you've already been billed for service. If service is included, you are not expected to add anything further but you may want to add a small sum for particularly good service or extra attention. If service is not included, plan to leave a tip of 12 to 15 percent. There are a few issues that are currently in contention about tips in the UK. First, even when it is included in the bill, the service charge is discretionary. You don't have to pay it and if you have had particularly bad service, you may not want to. Second, there is currently no UK law that requires restaurant managements to turn over the service charges they collect on your bill to your server. This has come as a surprise to many and there have been some unscrupulous restaurant chains that don't give that money to staff or only give a small part of it. make sure customers understand that service charge is discretionary. In the meantime, if you have had particularly good service and want to ensure that your server receives the tip you intended, you are free to subtract the service charge from your bill and then leave a cash amount, separately, for the server. And in restaurants where you suspect the management may be unscrupulous about turning tips over to staff, don't add your extra tip for good service on the card reader you are handed at the table. Leave the tip in cash and make sure your server sees it. You are not expected to tip with cash for drinks in pubs. If the barman gives you especially good service or fills several big orders for you, you can offer a small sum (the price of half a pint of beer, say), with the words, "and have one for yourself" or something similar. The barman (or barmaid) may pour themselves a drink on the spot or may put the money aside to have a drink later. You're not expected to tip for food in pubs either but, with the growth of gastropubs, this has become something of a gray area. If you feel the "pub" is more of a restaurant with a bar than a pub that serves food, you may want to leave a tip similar to what you would leave in a restaurant. At counters where food and drink is served to take away - coffee and sandwich shops, hamburger and fast food outlets - staff act as servers without having the opportunity of supplementing their usually minimum wages with tips. In those situations. It's not uncommon to see a tip jar, near the cash register or pay point, for workers to share. There's no pressure to top it up but people often leave the small change left after they've paid. .
About 10 percent of the total fare is usual for licensed, metered taxis. Rural taxis and minicabs usually charge a pre-agreed, flat fare and many people do not add an additional tip. Only tip hotel staff if they do something special for you. Chambermaids are not usually tipped. You can tip a bellman a pound or two for helping with your bags or a doorman for getting you a taxi. Valet parking services are uncommon and, when available, there's usually a charge for them, so tipping is unnecessary. Some hotels have started adding an optional service charge to bills. This is most common at hotels with spas and gyms, where staff are expected to perform extra services for you and is supposed to be distributed to staff members. If you would rather control the amount you tip particular individuals, you can have that service charge removed from your bill. At the end of guided walks or guided bus tours, guides often say, "My name is Jane Smith and I hope you enjoyed your tour." This is a subtle pitch for a tip. If you've had a good time and you've been well looked after and well entertained, by all means, give the guide a little something extra—usually 10 to 15 percent of the cost of the tour. Consider a minimum of £2-5 for a single traveler, £1-£2 per person for a family. On a bus or coach trip, the driver will often have a receptacle near the exit where you can leave your tip. If you've been on a tour of a few days, and especially if the coach driver has also acted as a tour guide, tip the coach driver an amount based on the number of days you've been traveling (£1-2 per day per person) at the end of the trip.